If there is one image of a Haiti street protest worth sharing, this one certainly is the one... Look at this amazing photo from the October 17 2018 Haiti street protest you probably haven't seen yet! You have to see it to believe it. 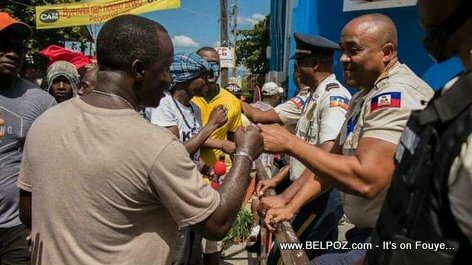 The media, national and international, often show you pictures of Haitian street protesters confronting the Haitian National Police men and women, tear gas thrown, and the policemen, overwhelms by their duty to serve and protect who often result to a little confrontation with the protesters but how often do you see this? They say a picture is worth a thousand words. How much is this one worth? Thank you, Dyab Baba, for bring this to my attention.